What the heck is business journaling and why do it? Running a business, whether you’re a coach or a massage therapists, takes so much time and energy. Why add something else to the to-do list? The answer is because business journaling helps you implement your vision, serve your customers, and thrive in business. Unfortunately, journaling has a bad rap for many people. I think it goes back to those horrible essays we all had to “write” in school. Let’s be real; those essays were painful to write. And then there is the memory of the diary, that little locked book containing your deepest secrets…until Little Sis stole it and blabbed it all to anyone who would listen. Yes, there is a reason people resist journaling. For every entrepreneur, though, business journaling is a secret weapon that gives them an edge. Three of my business journals. It is easy as an entrepreneur to constantly react. But that’s not always the best thing for the business. Journaling gives you time to reflect on your thoughts before acting. Research from Harvard, HEC Paris and the UNC Kenan-Flagler Business School shows that we feel more confident about our abilities and ideas when we have time to reflect. Journaling forces you to slow down and be present. Mindful writing — such as journaling on a specific topic — actually rests the brain and (potentially) sparks creativity. Similar to the way meditation works, handwriting increases neural activity in parts of the brain. It doesn’t matter what you’re writing; it’s the stimulation of the act of writing that has the benefit. Journaling is one of the few times people still write by hand. Handwriting also helps you retain information and sharpens your mind. And studies show it leads to more positive thoughts. Both are imperative for a thriving business. Journaling helps you find your unique voice. The more your write, no matter what it is, the more you connect with your own stories and gifts. This helps you better articulate what you do and the value you offer. You can get there with other forms of writing, but the private, unguarded nature of a journal speeds the process. 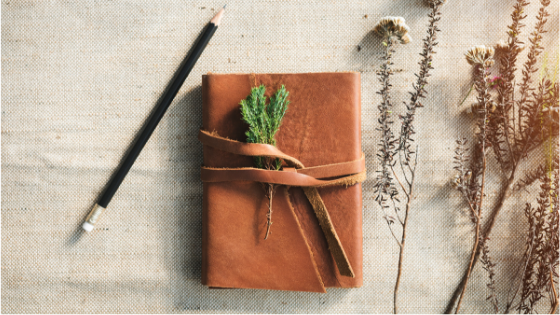 Business journaling provides a place to record your thoughts. As an entrepreneur, you likely have at least 20 thoughts a day about programs, products, collaborations, and more. Writing them in your journal means you’ll remember them. If you don’t write them down, chances are you’ll forget the great ones. The good news about business journaling is that there is no right or wrong way to do it. It’s a tool to keep your thoughts organized. You can jot bullets, write pages of prose, compose single sentences. Whatever works for you. My own journals are a combination of all the above. Since nobody will ever see it, it’s a free for all! I can’t count the number of times I’ve flipped through my business journal and found a great idea I had forgotten… and was now ready to implement. In fact, much of my current business is based on things I noted months before doing anything with them. Keep two journals: one by your workspace and a small one you carry with you so you can take notes on the fly. > My perfect work day looks like…. > In three years, I want to have…. > My clients ask me (insert something they ask) and I think (brainstorm solutions to the question)…. > If I tripled my business income this year, I would…. Don’t worry about writing essays, or even complete sentences. Jot single words, create sentence fragments, misspell. It doesn’t matter! All that matters is that you get your thoughts on paper. Include drawings or doodles… whatever inspires you. (I have a habit of doodling hearts. I don’t know why, but they are all over my business journal). Give it a try. 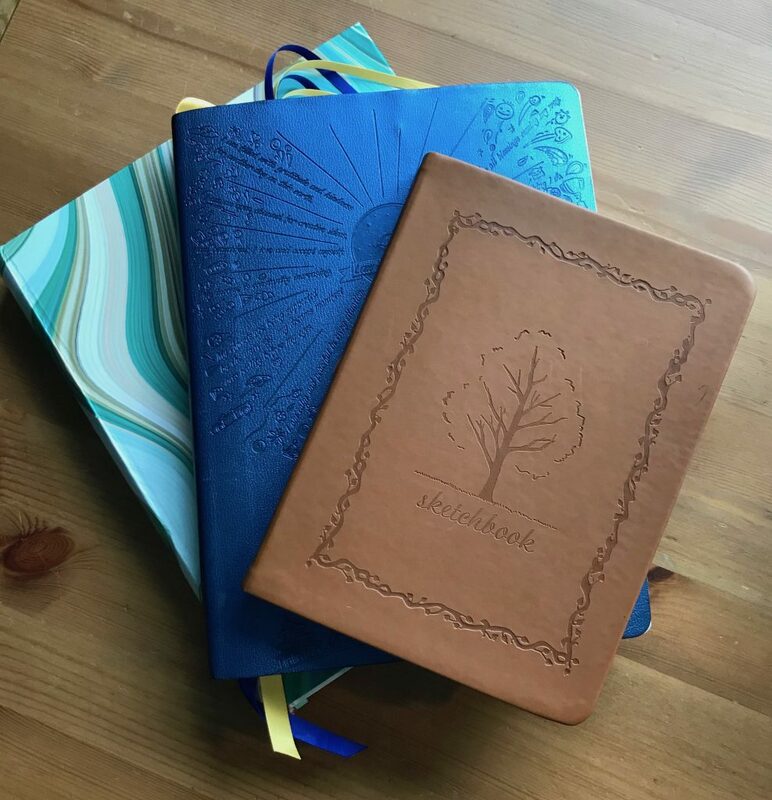 You may become as addicted to journaling as I am (those are just three of my journals pictured above)! The more you record your thoughts and ideas, the more you’ll have.